Glaucoma is a group of diseases that can damage the eye’s optic nerve and result in visual loss or blindness. The optic nerve is a bundle of more than 1 million nerve fibers. It connects the retina with the brain. 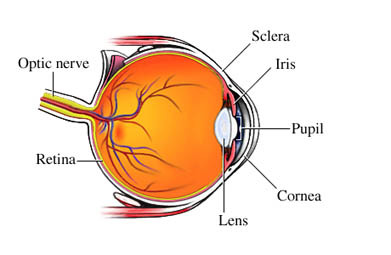 The retina is the light-sensitive layer at the back of the eye, which contains millions of cells called rods and cones. When the rods and cones pick up light, a chemical reaction takes place. This sends an electrical impulse from the retina, through the optic nerve, and to the brain. This is the sensation of sight. A healthy optic nerve is essential for good vision. Glaucoma is usually caused by an increase of pressure inside the eye. At the front of the eye, there is a small space called the anterior chamber, which lies between the iris and the cornea. Clear fluid flows in and out of the chamber to bathe and nourish nearby tissues. In most cases of glaucoma, for unknown reasons, the fluid drains too slowly out of the anterior chamber of the eye. As the fluid builds up, the pressure inside the eye rises. 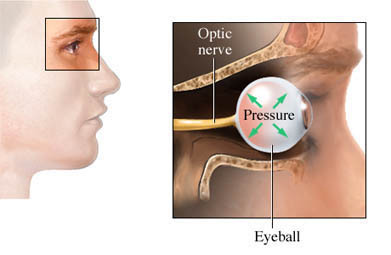 Unless this pressure is controlled, it can damage the optic nerve and other parts of the eye, leading to loss of vision. It is estimated over 3 million Americans have glaucoma. It is leading cause of legal blindness in the US. Open-angle glaucoma —Fluid can sometimes drain through the drainage angle of the eye too slowly, which leads to a fluid backup and a gradual but persistent elevation in intraocular pressure (IOP). The angle between structures of the eye appears normal or open. This is the most common type of glaucoma which may affect 1 in 40 adults. It usually begins after 40 years old. Angle-closure glaucoma —Drainage from the eye becomes physically blocked when eye structures, usually the iris, occlude an already narrowed angle of exit. This traps fluid in the eye and leads to an increase in IOP. Angle-closure glaucoma may be acute, subacute, intermittent, or chronic. Acute angle-closure glaucoma is a medical emergency that must be treated quickly to prevent visual loss or blindness. This is an uncommon type that may be more common in certain people. It usually begins after 50 years old and may happen in the other eye within 5 years. Normal or low-tension glaucoma —The optic nerve is damaged even though the IOP is not elevated. This form is poorly understood. Congenital glaucoma —This type of glaucoma occurs either at birth or within the first few years. It is usually related to defects in the eye that slow the normal drainage of fluid. Secondary glaucoma —This type of glaucoma can develop as a complication of another medical condition. Examples include tumor, inflammation, diabetes, eye injury, or long-term corticosteroid therapy. What are the risk factors for glaucoma?What are the symptoms of glaucoma?How is glaucoma diagnosed?What are the treatments for glaucoma?Are there screening tests for glaucoma?How can I reduce my risk of glaucoma?What questions should I ask my healthcare provider?What is it like to live with glaucoma?Where can I get more information about glaucoma? Angle-closure glaucoma. EBSCO DynaMed Plus website. Available at: http://www.dynamed.com/topics/dmp~AN~T901114/Angle-closure-glaucoma . Updated July 15, 2016. Accessed February 12, 2018. Facts about glaucoma. National Eye Institute website. Available at: https://nei.nih.gov/health/glaucoma/glaucoma%5Ffacts. Updated September 2015. Accessed February 12, 2018. What is glaucoma? American Academy of Ophthalmology website. Available at: http://www.aao.org/eye-health/diseases/what-is-glaucoma. Updated March 1, 2017. Accessed February 12, 2018. What is glaucoma? Glaucoma Research Foundation website. Available at: http://www.glaucoma.org/glaucoma. Accessed February 12, 2018.